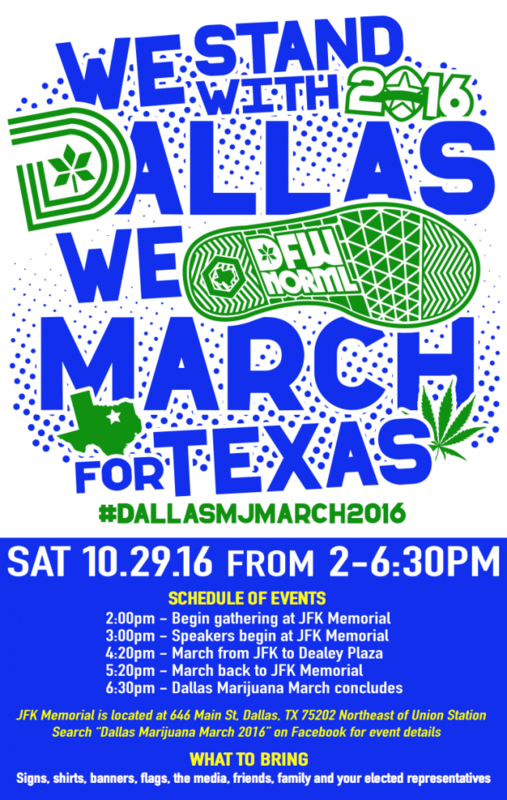 For the 3rd year in a row, DFW NORML is proud to present the Dallas Marijuana March on Saturday 10/29 at JFK Memorial starting at 2pm, with a march to Dealey Plaza and back. #DallasMJMarch2016 is free to attend and open to the public. This event is being held with the respectful cooperation of the Dallas Police Department, so please thank all of the police officers when you see them on Saturday! 2pm – Event staff & attendees begin gathering at JFK Memorial (646 MAIN ST, Dallas, Texas 75202). 3pm – Speakers begin at JFK Memorial. 4:20pm – March from JFK to Dealey Plaza. 5:20pm – March back from Dealey Plaza to JFK. 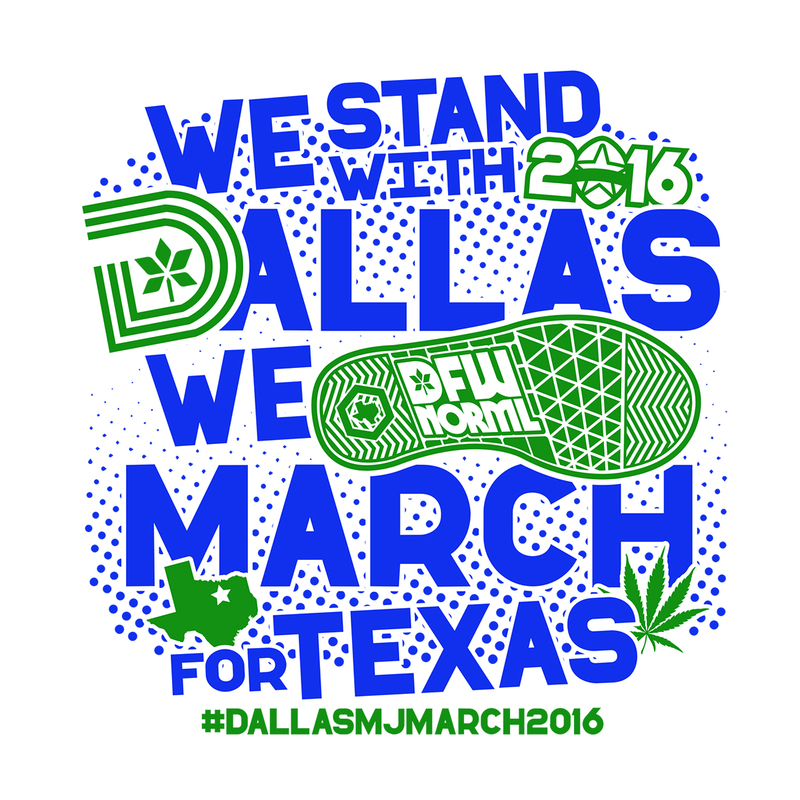 6:30pm – Dallas Marijuana March concludes. There will be an after party at The Cherry Apothecary (222 W Jefferson Blvd #C, Dallas, Texas 75208) from 6:30pm – 8:30pm including a raffle for custom glass and a $200 hoverboard donated by DFW NORML Freedom Fighter sponsor Mother Earther and other goodies. Dallas MJ March Facebook Event Page: official Facebook event page for additional details. For the first time ever, an active duty Dallas Police Officer will be speaking at the Dallas Marijuana March! 2. Jeremiah Looney is a medically separated Army Veteran turned activist who’s activism led him to running for mayor of his hometown of Whitewright, Tx and winning! Mayor Looney plans to spark changes from inside the system. 3. Ed Rankin, candidate for US Congress in Texas District 32 with the aim of restoring values enriched in the Constitution, Declaration of Independence and the Bill of Rights. 4. Bob Smilie is a husband, father of 4, trucker and a Juror Rights Activist for the Fully Informed Jury Association. He believes the War on Drugs is a War on our Freedom and wants to educate Texans about how to end this war with Jury Nullification. Alcohol Prohibition was ended with Jury Nullification and Bob believes that Cannabis Prohibition will be ended with Nullification too. 5. Michael Blackert was born in Arizona in 1981 and enlisted in the Army out of Alabama in 2004 shortly after meeting his wife (then girlfriend). After serving ten years in the US Army and three years spent in serving in five of the seven campaigns in Iraq during Operation Iraqi Freedom, he was medically retired as a Staff Sergeant because of the many injuries sustained while deployed. Today he resided in Fort Worth, TX with his two children and loving wife. He is currently a senior at Texas Christians University completing his Bachelors of Social Work and hoping to start his Masters in August 2017 at TCU. 6. US Navy Veteran and college student Rob Williams will be giving his first public speech about the injustices faced by our veterans being forced to take pills instead of a non-toxic therapeutic herb like cannabis. 7. After honorably serving in the U.S. Army, Chad West sought to practice law in order to protect the rights of individuals. Chad has led the charge on countless high stakes Federal and State criminal cases in Texas, has been selected as a 2014-2016 D Magazine “Best Lawyer” and has been selected as a 2011-2016 “Rising Star” by Texas Monthly. Passionate about marijuana reform, Chad co-authored the state’s first medical marijuana bill and is a proud lifetime member of Texas NORML. 8. Juliet Suzzane Giglio is an Army brat born on Okinawa, who joined the Army after high school and served during Desert Shield & Desert Storm. She was a career Corrections Officer for the Pennsylvania Department of Corrections before having to take a disability retirement. She moved to Dallas in 2013 to be near family and joined DFW NORML in 2014. She will be speaking about how medical marijuana changed (and saved) her life. 9. Dena Kirk is entering the cannabis industry as a business consultant, helping dispensary owners with the documentation necessary to receive their licenses from the State of Texas. As the wife of a U.S. Navy veteran and the mother of a son on the spectrum, she is advocating for expanding the qualifying conditions of the Texas Compassionate Use Program to include, at the very least, PTSD and autism. Dena is an avid gardener and hopes to one day have the right, by law, to use her green thumb for growing cannabis at home, and to create medicinal tinctures to relieve the suffering of her family and friends. 10. Barbara Humphries Johnson is the Patient Outreach Coordinator for DFW NORML and is a Breast Cancer survivor. She will speak about her use of Cannabis during cancer treatments and how it helped her, and the upcoming Legislative session and how you can get more involved. She is very dedicated at reaching out to Patients and offering them support. During her Cancer battle she visited the Texas Capitol on eight different occasions to Lobby for Cannabis reform and to speak at hearings for Cannabis related bills. 11. Russ Belville, a nationally recognized journalist who writes for the Huffington Post, High Times Magazine and is host and News Director for Cannabis Radio. 12. Shaun McAlister, executive director of DFW NORML since 2011 and event organizer of the Dallas Marijuana March.